Where can I buy a Gift Card to PJ Whelihan's, The Pour House, The Chop House, Central Taco and Tequila, or Treno? What is a PJW Restaurant Group eGift? Our eGift option is a quick and easy way to send someone a gift that's always in good taste. These virtual gift cards can be emailed directly to the recipient, so you'll need to have a valid email address for them to complete the transaction. Select the amount for your eGift and the date you'd like to send it – it's that simple! Our eGifts are available in denominations from $10 to $500. 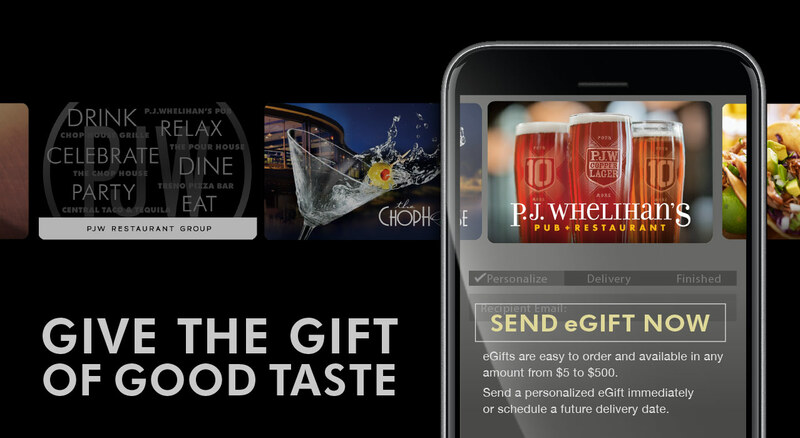 Where can PJW Restaurant Group Gift Cards and eGifts be used? 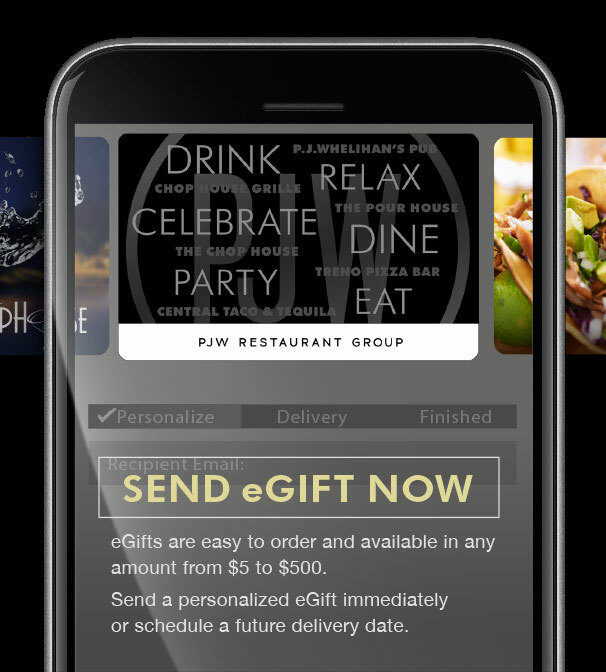 How are PJW Restaurant Group eGifts redeemed? You can print the eGift and present it to your server or simply display the email containing the eGift on your mobile device at time of redemption. When should I expect to receive the email with the eGift card? Upon successful payment processing, eGift cards are sent within 10-15 minutes. At time of purchase, customers also have the option to delay delivery until a future, specified date. Where can I check the balance on my PJW eGift or PJW Restaurant Group Gift Card? Click Here and enter your card number and registration code. Contact [email protected] with any additional questions. eGifts and Gift Cards are issued by and represents an obligation solely of P.J.W. Restaurant Holding, LLC.